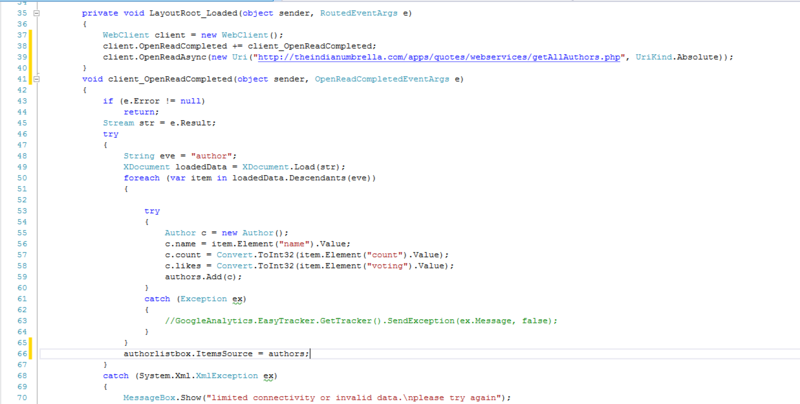 This post will explain how you could parse remotely located XML feeds and display content in Windows Phone 8 app. Here’s an sample XML file which we plan to fetch and display as a list in our app. If you are not familiar with XMLs then you could refer to some basic tutorials on w3schools.com. Here are few things worth remembering..
XML documents must contain one element that is the parent of all other elements. If you have a database on some server, you can easily create a web service for it and use the web service to get content for your app. This is useful when you already have things setup for your website and want to take it to mobile with native apps. Also if you have an app on one platform its easier to develop it for another using the same web services. It keeps your data synced and frees you from worrying about data inconsistency. Here’s the PHP code which I used to generate the sample XML file. I fetch the rows from MySQL database and echo it within properly nested tags. You could pass GET/POST requests to filter the data which you want to return. 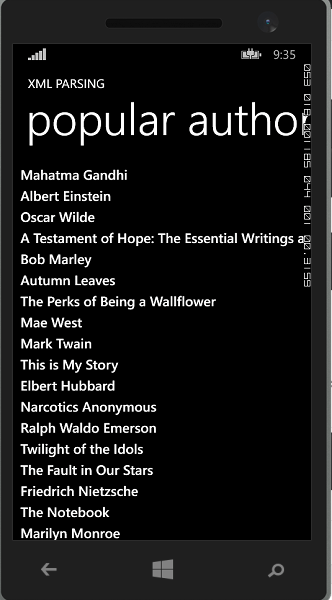 For example, you may choose to display only authors with count greater than 20. Now lets jump into building the app. In this tutorial we are fetching all the authors from a XML file. So we name our class Author which will store an author’s data. Add a loaded event handler for MainPage.xaml‘s LayoutRoot and add the code below to make a call to a WebClient and fetch the XML file. We earlier created a list `authors` to store the details of all the authors. We will use it now while parsing the XML. That’s all you need to do. Try deploying the app in the emulator and see how it works. Suppose you have the XML stored locally in your app. Then you could use the following code to parse and display it. 2. Choose the properties option in the list given in the solution explorer. 3. Then under the properties menu click on WMAppManifest.xml. 4. The following window will appear before you. 5. Now you can see the Display Name option. It is the name of your windows phone app by which it will be known in the windows phone market. You can change it accordingly. By default the name of the project is the name of the app. 6. By using Tile Title option you can change the title of your application tile that will be pinned to start screen. 7. I hope this post will be helpful to you. Getting started with app development is the toughest part. There are chances that you may not find the right resources or end up getting struck on the most basic things. Sometimes tutorials don’t cover what they feel is obvious. We will be assuming in each of our articles that this topic is completely new for you. That way experienced developers could skip some steps while beginners won’t miss out the basics. 1. First of all create a new blank project and name it myfirstapp. 3. Then change the name of the application from my application to myfirstapp and page name to first page in Xaml code as shown below. 4. Then drag a Button control and Textblock control from the toolbox given on left hand side. 5. After that the following screen appears before you. 6. 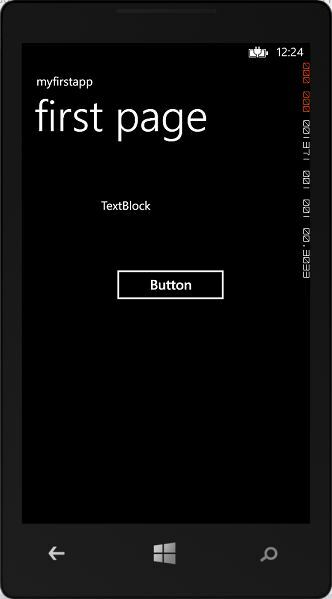 Now give a name to the Textblock that is myblock in xaml window. 7. Now double click on the button you created. The following screen will appear before you. 8. Add the following code in the Button_Click_1 event handler function. 9. Now the page will have the following view. 10. Now click on the Emulator option given in the header menu. 11. If the emulator is not starting you can choose any other option from the list. 12. After the emulator has started and you can click on the button in your app. 13. You will see that the text of textblock has changed to Hello world. 14. You have successfully created your first application. You can get the project zip from the link below.